In “A Quiet Place,” silence equals survival. 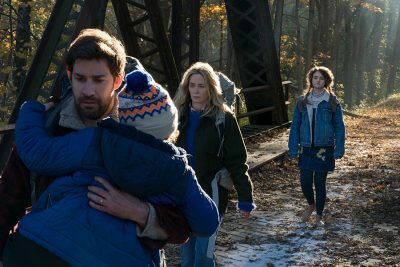 John Krasinski’s newest film, which follows a family hiding from monsters that hunt by sound, will premier in theaters nationwide Friday. A self-described “scaredy-cat,” Krasinski said he’s normally too scared to watch horror films, let alone write, direct, produce and perform in one. In the end, Krasinski said, his fear actually wound up being a creative advantage. Just a year ago, Krasinski said, he thought he’d never direct something like “A Quiet Place.” But weeks after his second daughter’s birth, he received the script and really connected with it. From there, he proceeded to rewrite the original script. Simultaneously wearing four different creative hats, Krasinski said, made the movie the most intense project he’s ever done. When he rewrote the script, he focused on making every single part of the film “come back to being a family.” In his eyes, “A Quiet Place” was actually more family drama than horror film. The horror, Krasinski said, comes from the audience’s emotional attachment to the family. His biggest filmmaking regret? Not being a better student. In the film, one of the family’s children, Regan (Millicent Simmonds), is deaf. Simmonds, best known for “Wonderstruck,” lost her hearing during infancy. Krasinski said casting a deaf actress was “non-negotiable” and Simmonds was both a spectacular actress and teacher, patiently correcting her co-stars when they fumbled new signs. While they were shooting, Krasinski said, Simmonds observed her co-stars’ respective characters actually coming out in the ways they were signing. The film marks Krasinski’s first on-screen collaboration with his wife of eight years, Emily Blunt. He’s called Blunt’s agreement to appear in the movie “the greatest compliment of [his] career.” Their work together, he said, is much like their marriage — a constant collaboration. Perhaps fittingly, filming “A Quiet Place” has given Krasinski a new appreciation for calmer soundscapes, like nature. Now, he regularly takes his daughter sky gazing, using the time to clear his head and simply listen.